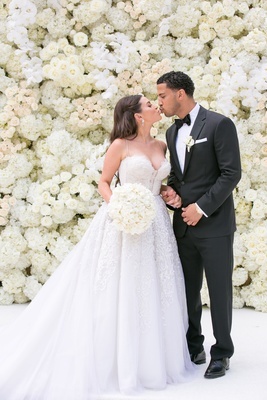 After a surprise proposal at home with a hidden photographer, Keny Cohen and Manny Smith – an executive at Interscope Records – were ready to spend the next 14 months wedding planning. 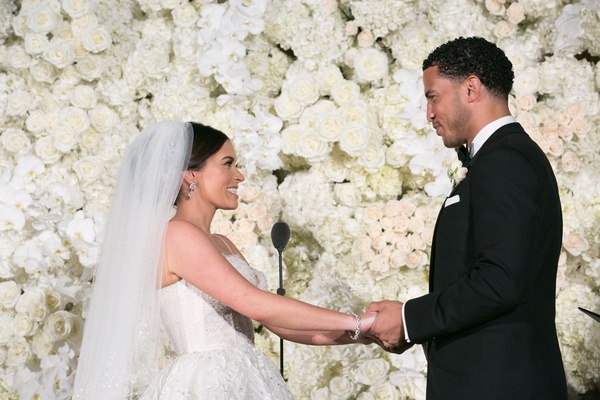 Though Keny initially hoped to wed at the home of her parents, the couple ultimately settled on a famed hotel in Beverly Hills. 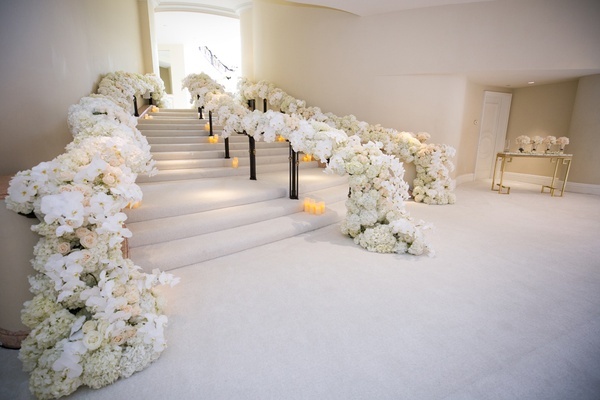 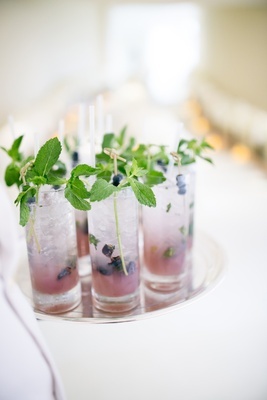 “It worked out perfectly and I’m so happy that I did it there,” the bride affirms. 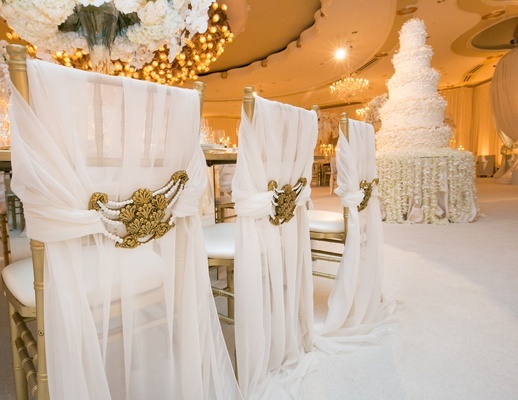 Ivory and gold was quickly selected as the color palette for the big day. 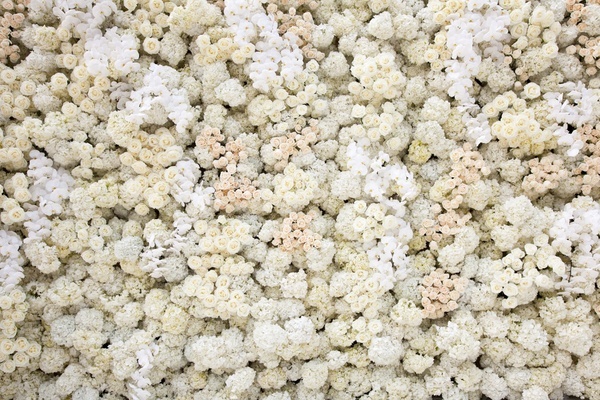 “I was strangely very against bright white for anything because I didn’t want it to look modern or have blue tones,” Keny explains. 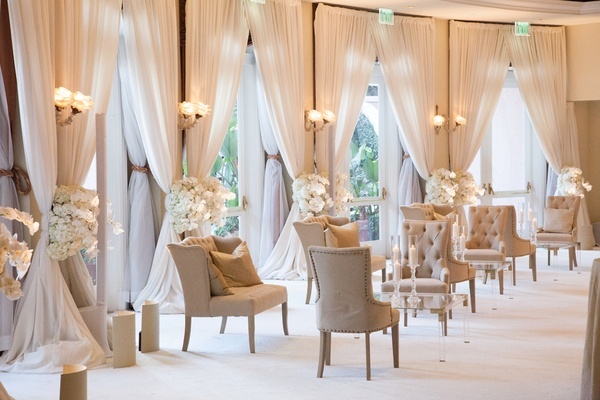 “I wanted everything to looks very classic, timeless, and romantic.” White Lilac Inc. was brought on to not only provide the floral and event design, but to plan the festivities as well. 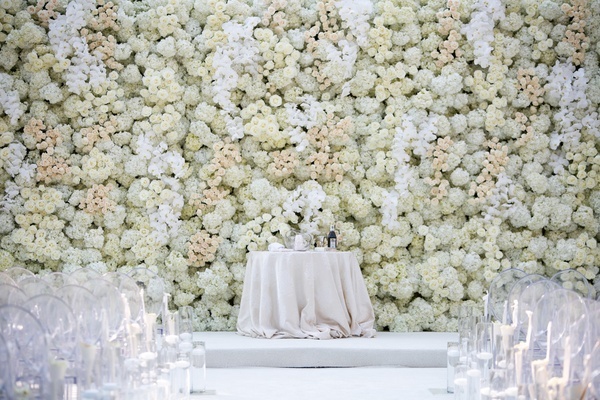 A grand, elaborate floral wall filled with white orchids, ivory hydrangeas, and champagne roses made for a stunning backdrop to the outdoor, interfaith ceremony. 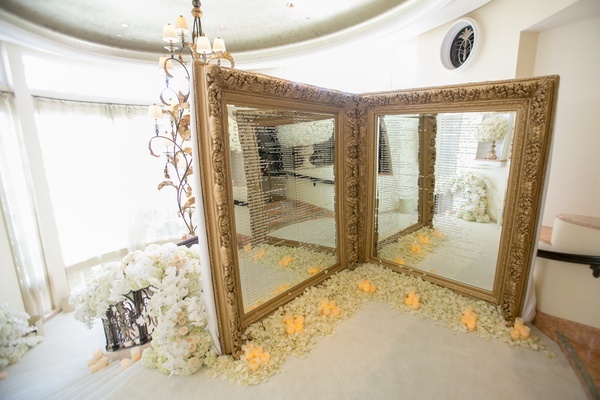 “I am half Jewish and Manny is Christian, so we made sure to incorporate aspects of both in our wedding,” notes the bride. 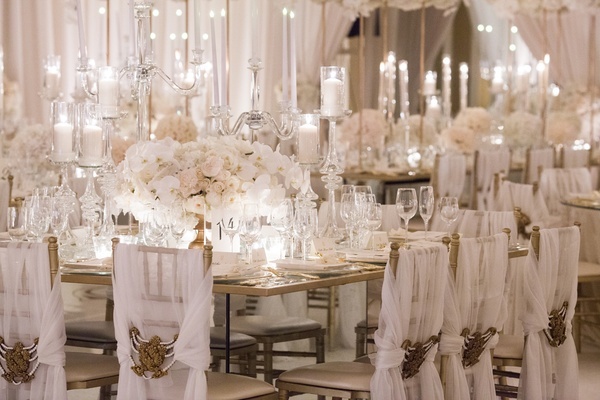 The vow exchange included the lighting of a unity candle as well as the breaking of the glass, while the reception started with everyone saying grace before dinner and included the hora, complete with a chair lift of the bride and groom. 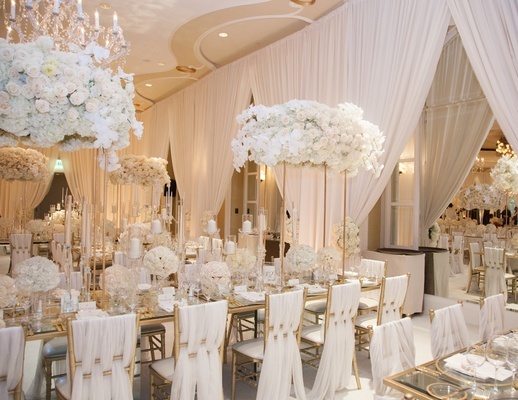 After Keny and Manny were pronounced husband and wife, they and their 375 guests entered the ballroom to discover a perfectly decorated space. 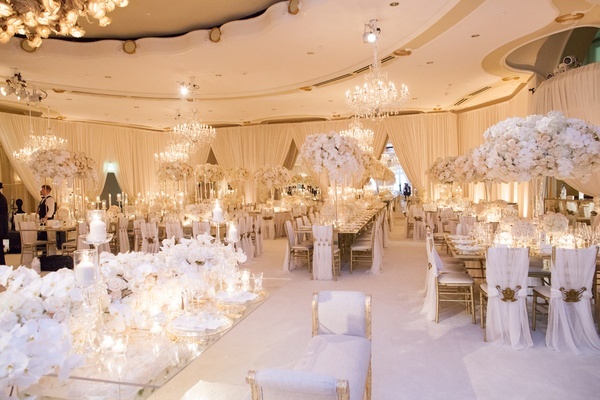 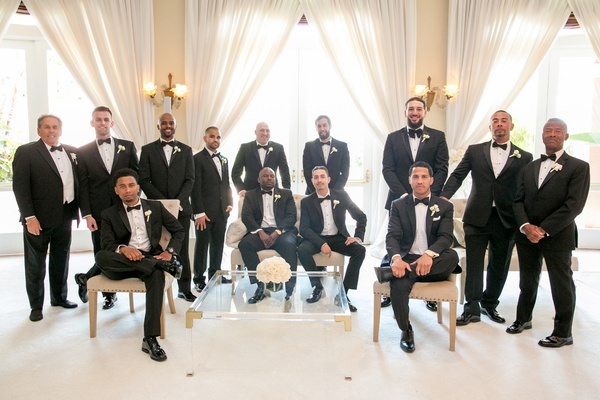 The bride’s vision was brought to life in a room full of cream tones and gold accents. 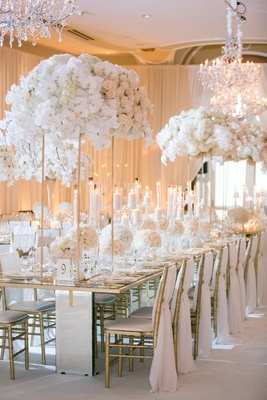 While it may seem impossible to top the floral wall from the ceremony, the lush centerpieces came close. 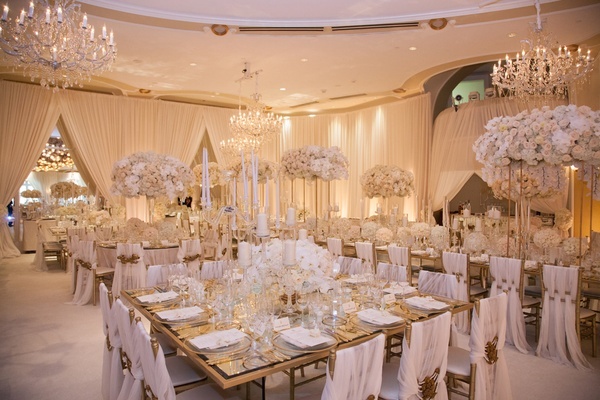 “We also had a lot of crystal candelabra to give the tables dimension and sparkle,” Keny notes. 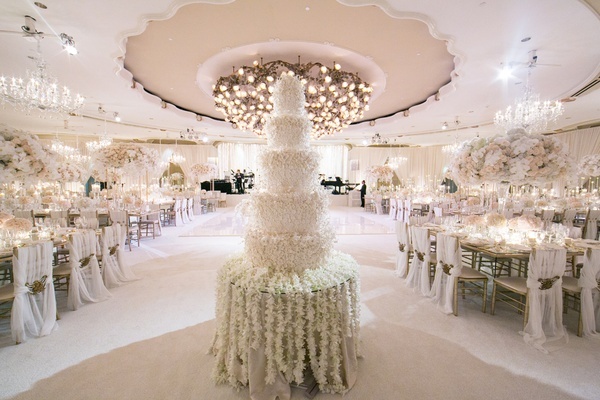 Perhaps the biggest masterpiece was the cake – all five tiers and six feet were covered in sugar flowers. 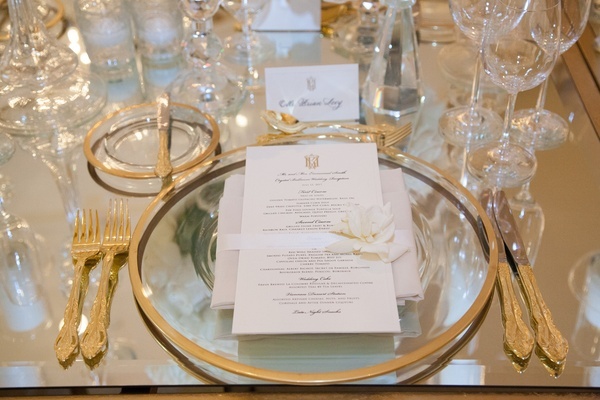 A different flavor for each layer helped to satisfy the groom’s sweet tooth, with supplementary treats provided by an extensive dessert table. 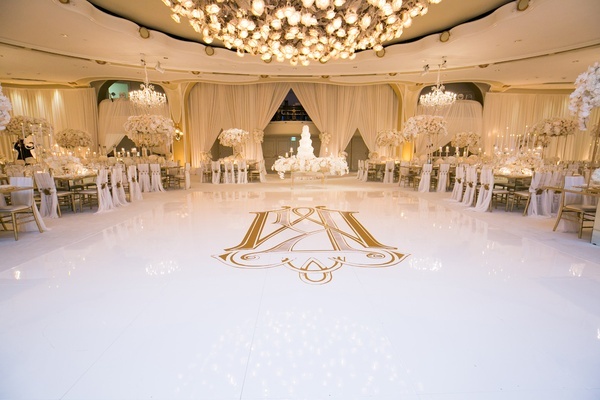 Revelers stayed on the dance floor – featuring a custom monogram – until 2AM, enjoying a variety of musical acts, as the newlyweds couldn’t decide on just one band. 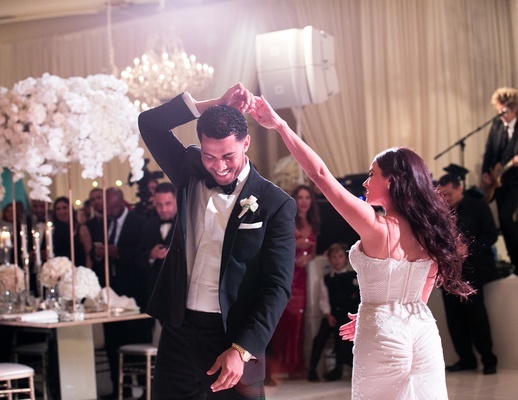 “It really made the vibe fun and kept everyone on the dance floor,” confirms the bride.